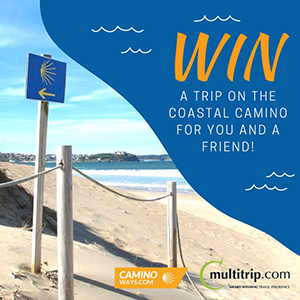 To get you started on your Camino adventure, We have teamed up with Multitrip.com to offer you the chance to win an unforgettable 7-day trip on the Coastal Camino for two people; as well as annual travel insurance for two people. Multitrip.com is part of the Blue Insurance Group, a multi award winning Irish Company that specialises in a range of insurance products, including car and home insurance. The Camino de Santiago is an ancient route that will take you through some of the most delightful towns in Northern Spain. Each year pilgrims from all over the world follow in the footsteps of St James to Santiago de Compostela. People walk this beautiful trail for many reasons. Whatever your reason this unique journey will leave you will a lifetime of memories. Enjoy starting this coastal route in the charming town of Baiona where you can enjoy a dip in the sea before you begin your walk. This walk takes you through the heart of the Rías Baixas region, famous for its Albariño white wine and delicious shellfish. CaminoWays.com have partnered with Multitrip.com to give one lucky winner the chance to experience the Camino with a friend this year, walking the last 100kms of the famous Portuguese Coastal Way from Baiona to Santiago de Compostela. Competition open to Republic of Ireland residents only. Competition is open until 15th May 2017. Winners will be announced by Multitrip.com and CaminoWays.com in early May. Holiday prize includes 6-night accommodation on B&B basis, luggage transfers and holiday pack for 2 people from Sarria to Santiago de Compostela. Premier Travel Insurance Policy for 2 people provided by Multitrip.com. Travel dates subject to availability. Winners must book in 2017 to travel by 1st June 2018. No flights or transport included. By entering this competition, you agree to register for the CaminoWays.com and Multitrip.com mailing list. Hi Sylvia, I can enter your name manually in the competition. Could you please email your answer to marketing@caminoways.com. 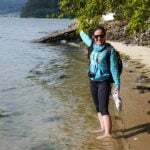 Best of luck, Lisa at CaminoWays. Hi Catherine, if you would like to send an email to marketing@caminoways.com I can manually enter you in the competition. Best of luck. Kindest regards, Lisa at CaminoWays. Submit button not working. This is the message l received. Thanks Damian. I will look into that now and see if it’s a technical fault. your submit button in the competition doesn’t work – I’ve been trying all day and get the following message:There was an error trying to send your message. Please try again later.